The end of the year is a great time for reflection. Our students have worked very hard to learn new skills and refine old ones. Great progress has been made, and it should be celebrated! Each year, my school hosts an academic fair, and in pretty typical fashion, students display work and projects they have completed throughout the year. This is my first year at the school, so it is also my first year participating. As a team of reading intervention teachers we don't do a lot of projects, but we see a lot of growth, so we made an exception and celebrated our students too! 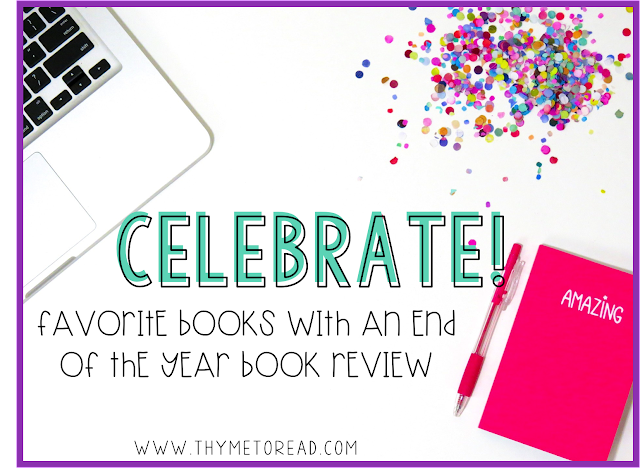 Keep reading to learn more about the project my students completed, and how you can implement in your classroom so your students can revisit favorite books from throughout the year. Keeping track of all the books my intervention students have read throughout the year is not a strength of mine! We have an intervention kit, with leveled readers, but I tend to stray don't follow the sequence at all. So I really relied on my students to remember what books were their favorite. It was really interesting to see what books my kiddos picked. Some of the younger girls shocked me by picking non-fiction. One of my boys who has made MONUMENTAL growth this year, without hesitation picked one of the first books we read in September. But the important part was that they picked the book, so they would be more invested. We thought it would be really cute to make BOOK WORMS! Once my students had their books picked, we gathered materials to construct the reflection books. Good news, it's super easy! Now that you have gathered all of your materials, it's time to get your students planning. When I did this project, I had my older students select what information from the book they wanted to highlight. For my littles, we worked together to set up each page, but there was some encouraging that pushed them in a certain direction. 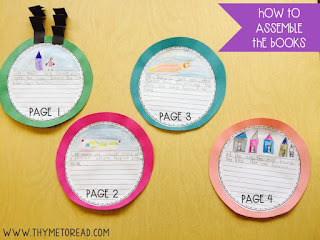 They used the rough draft paper, included in the writing paper template to plan out their ideas. Each student included information like characters, setting, summary, favorite part and a book recommendation for fiction books. For non-fiction they wrote about, three interesting facts, new vocabulary, something they were still wondering about, something about text structure (sequence, compare/contrast) and a book recommendation. For my younger students, I provided them with sentence starters, but my older students got right to work. Most of them needed to refresh their memory, and took a minute to revisit the book. I did some conferencing with each student to help them recall facts and previous discussions we had while reading the book. Then the students worked with a peer to edit their rough drafts before moving on to their final copy. The final copy paper I used is also available in the paper template. For organization purposes, I had the rough draft papers stapled in a packet, the final copy circles stapled in a separate packet, and when students came up to select construction paper for their background, I stapled those in a third packet. All three packets were tucked nice and neatly into the book each student picked. Then as they completed each step, the materials for the next step were readily available for them to move on. Take the first page and lay it text UP on the desk, put a dab of glue on the RIGHT side. Take the second page and lay it text DOWN on top of the first page. So now you are looking at the back of the second page. 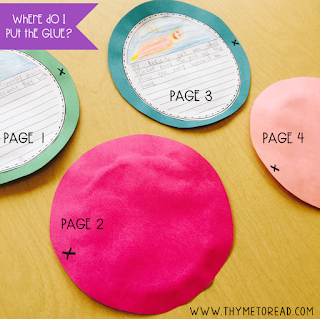 Put a dab of glue on the LEFT side of the (2nd) circle, and lay the third page text UP on top of the second page. Now you are "back to the beginning" with a text page facing up. 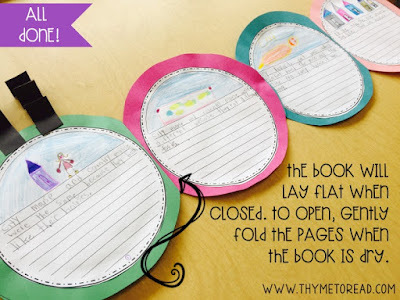 So you will put a dab of glue on the Right and lay the next page text DOWN on top. Continue this process until all pages have been assembled. When the book is closed, the front cover should be blank. I had my students decorate the front cover with eyes, a mouth, antenna, the title and their name. 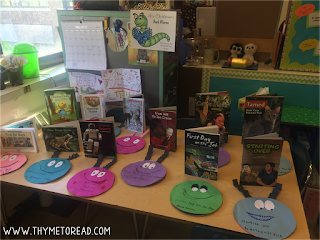 For the night of our academic fair, I placed each Book Worm with a copy of the book each student chose on the table. When the books worms are dry, they lay flat. 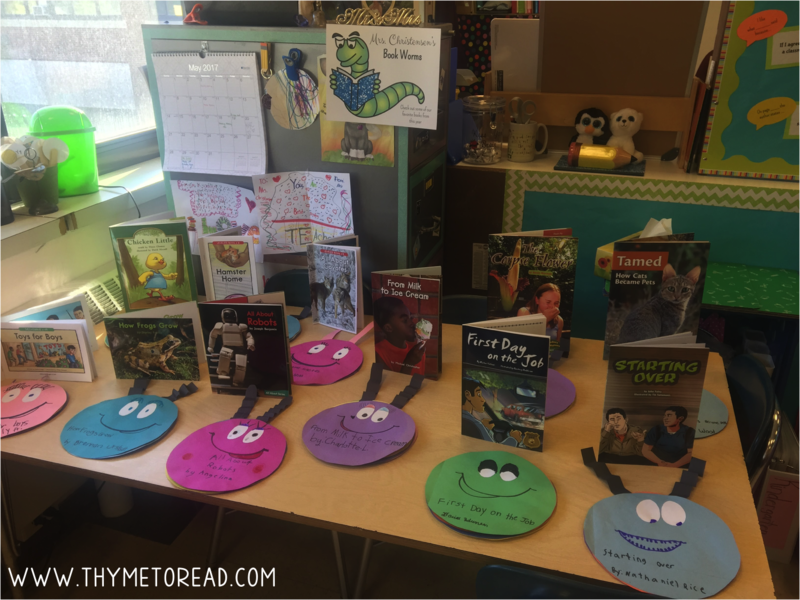 This was a great solution, so we could display MANY books on our tables at once, but not limit the students on how much they wanted to share. 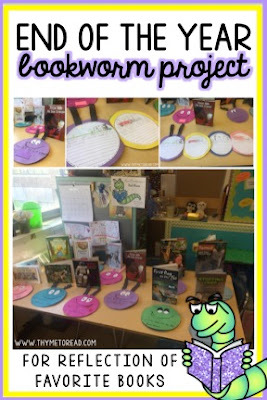 It also worked out perfectly because some of my students (even within the same grade level) really pushed themselves and completed a 5 piece book worm, while other students only completed three pieces. Displaying the books flat on the table did not "show off" the work the students did at first glance or provide a quick opportunity for comparison. Almost every project showcased a DIFFERENT book we have read this year. It was great to have a wide variety. The students were proud of their work, and the parents were impressed with HOW MANY books they have read this year. The younger students loved checking out the older kids' book projects, to see what they might read in the coming years, and each Book Worm served as a recommendation for other students. Overall, it was a great night and the students did a great job of showing off their progress. I hope this book project will help you in planning a way to celebrate how far your students have come. You could also keep these projects for your incoming class. This would be a great way to get them energized about the year to come, and as a way for this year's class to welcome your new students in September.